Happy New Year! Soup for you! We hope 2017 is off to a great start! It seems that every time I turn around, a week or two has passed! Yikes! I have been on a mission to make a more concerted effort to eat as organic as possible and have been busy in the kitchen. Since my Daria continues to bring me wonderful organic food from the Lancaster Co-op, I have been creating recipes to satisfy our appetites and souls. 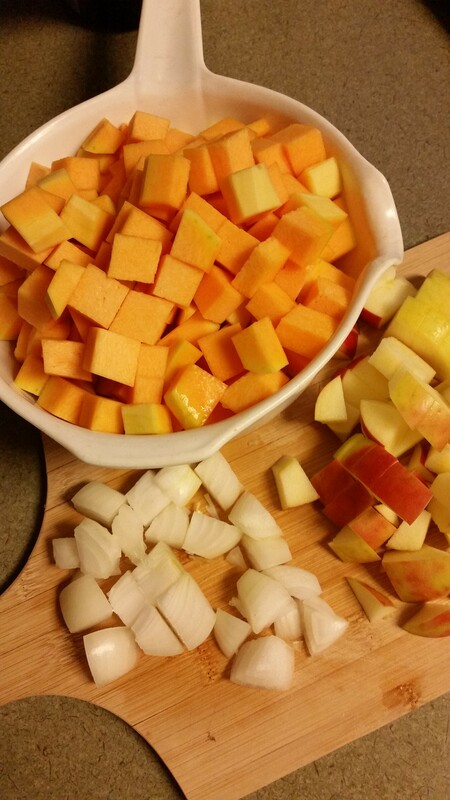 Here is a creation of a butternut squash soup with apples….all organic and all delicious! And did I say it was easy? All you need is a saucepan, a bit of time, a blender, and you are set! NOTE: In order to infuse the flavors, you need to cook the ingredients on the stovetop before blending. 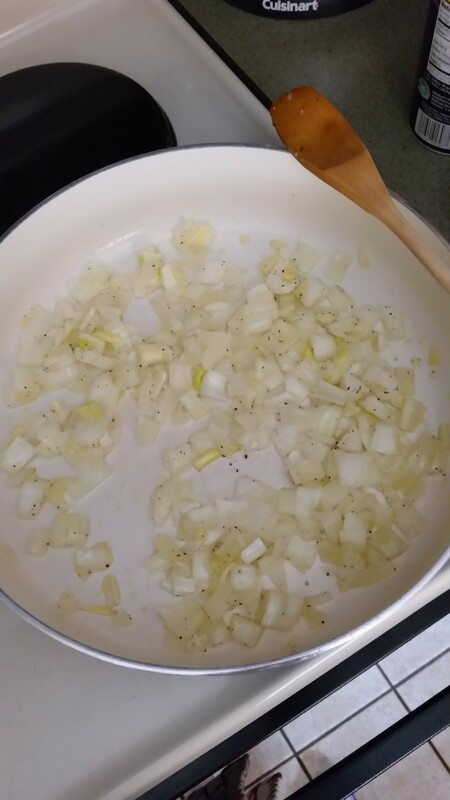 Add olive oil to large saucepan and when hot, saute onion and garlic until translucent. 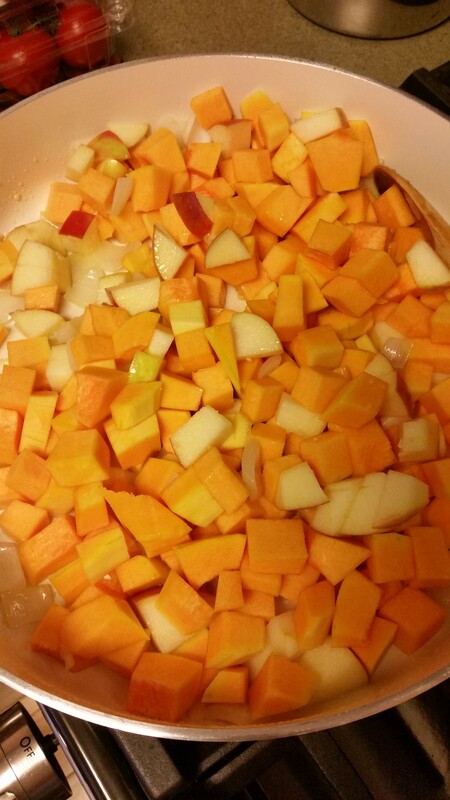 Add the squash and apple and cover with the veggie stock. Add the thyme, cinnamon and salt. Now put the squash mixture into your blender and blend until smooth! 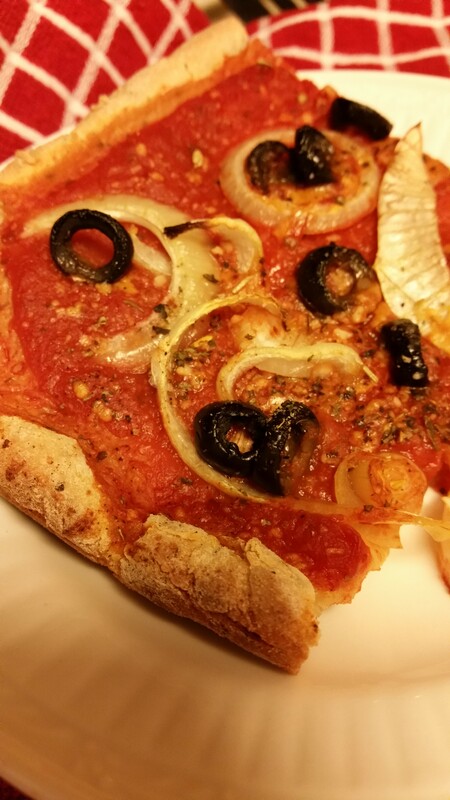 Meatless Monday….any day of the week! 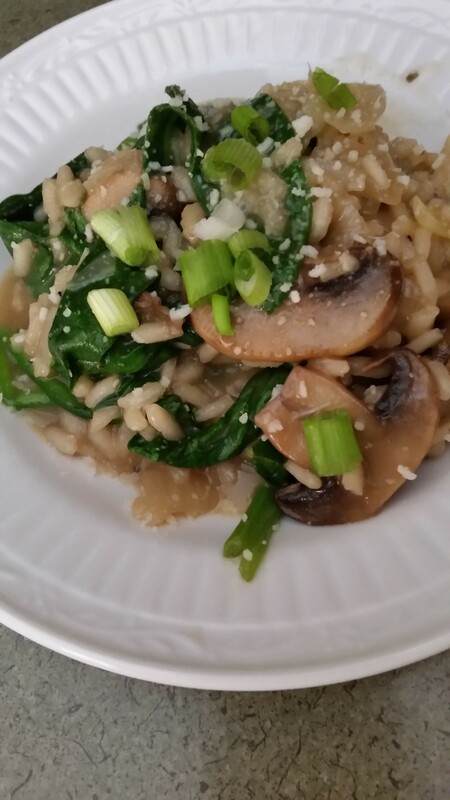 I woke up and I was craving risotto! No kidding….couldn’t stop thinking about it! Talk about strong Italian roots! So I decided to scan the web and look for a recipe that included spinach. It was a must-have ingredient for me! Lo and behold after a short while scanning recipes, I found it! Woman’s Day never lets me down! LOVE their site and especially the recipes! Here is what presented itself to me and I ran to the grocery store to fulfill the ingredient list. Such simple ingredients and so wholesome! You gotta try this simple recipe! 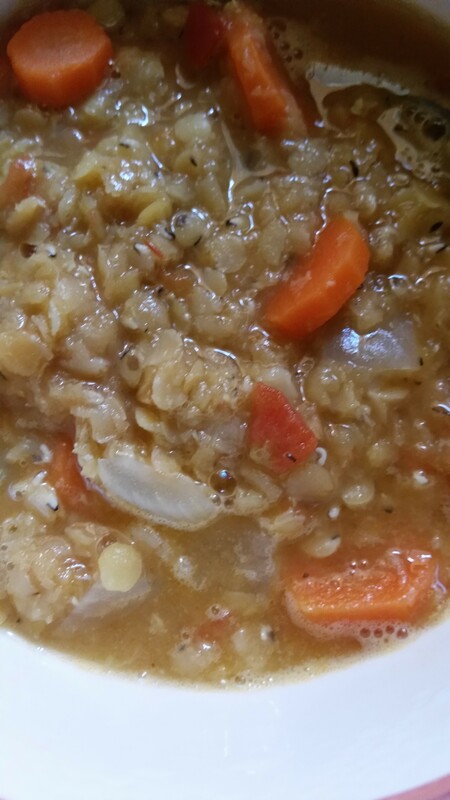 Upon reading the recipe, I did things in a little different sequence and chose to add ½ cup of veggie stock at a time, rather than all at once….the risotto came super creamy! If you have the extra time, in my humble opinion, it’s worth the effort! 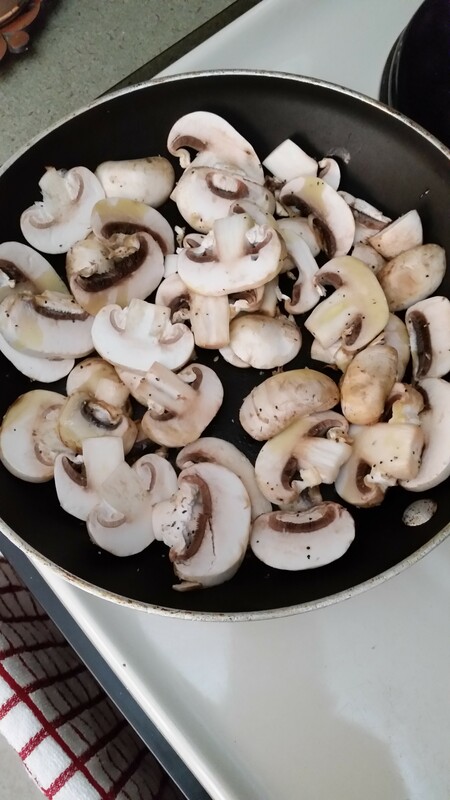 Sauté the mushrooms in olive oil until they are happy! 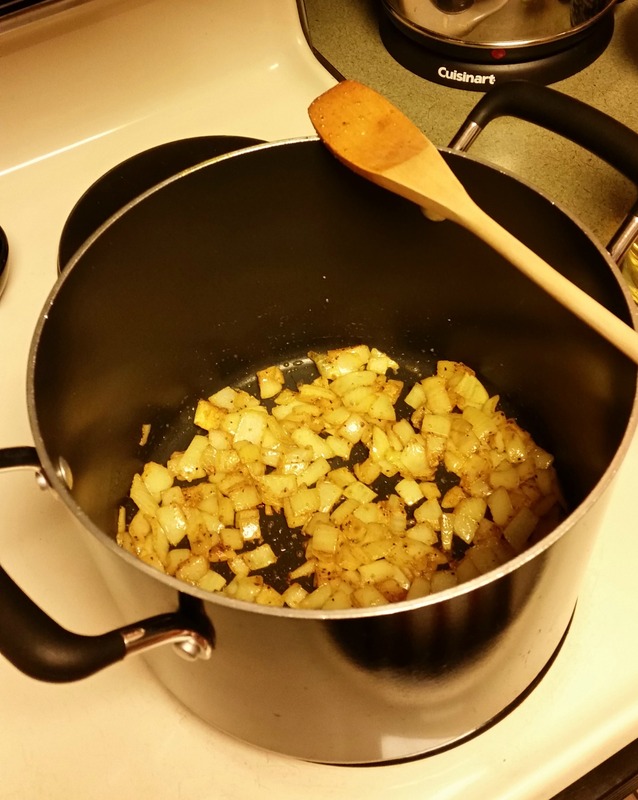 Now sauté the onions and garlic…smells amazing! 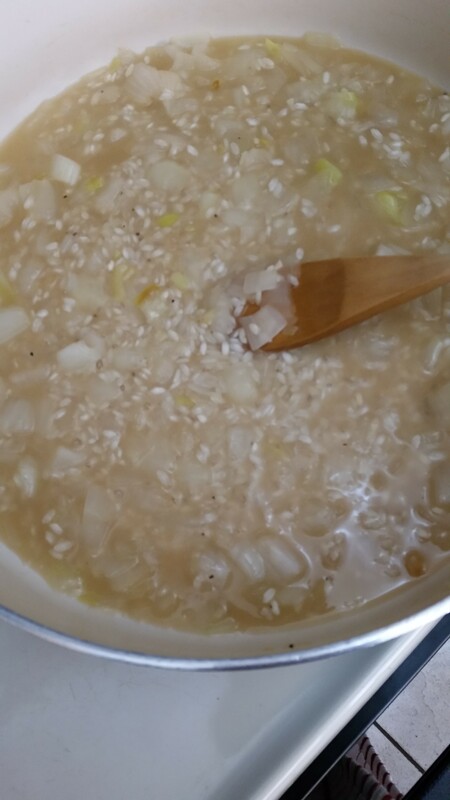 Add the Arborio rice and then the white wine…oh yum! 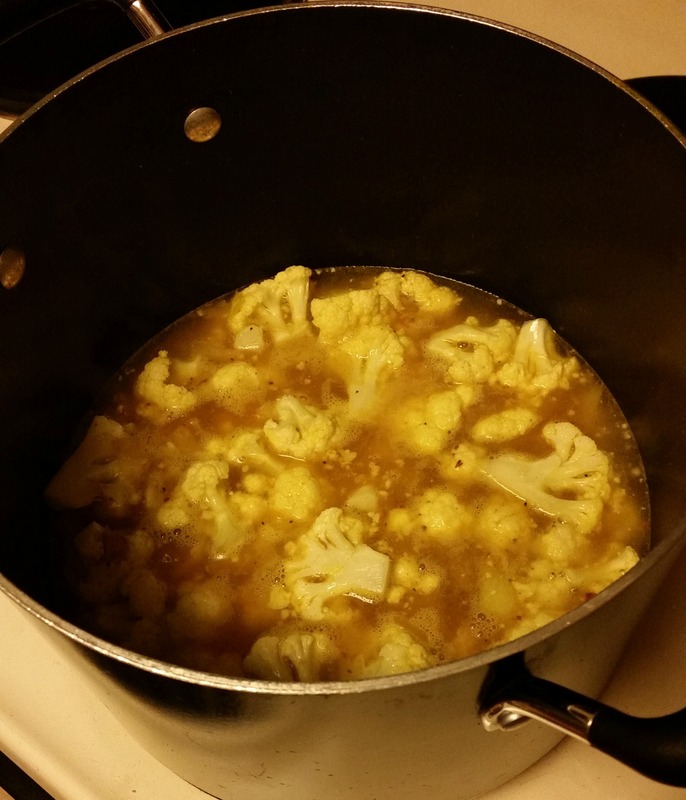 Start adding the veggie stock a little at a time and stir often….the consistency will be smooth as silk! 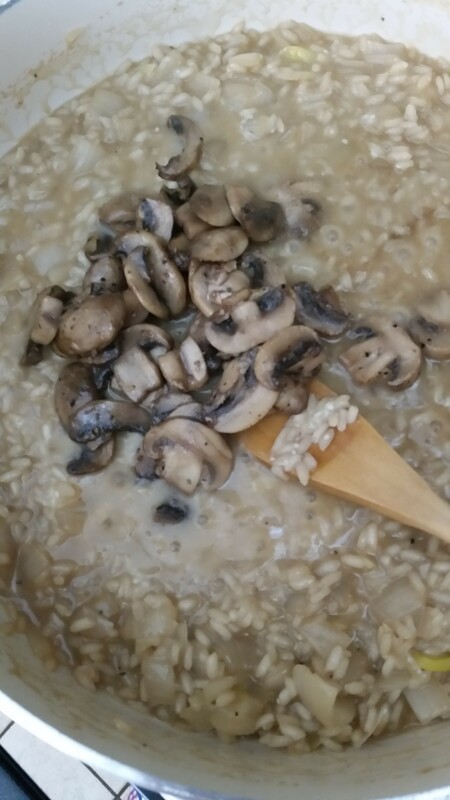 Don’t these mushrooms look ready to jump in the risotto? 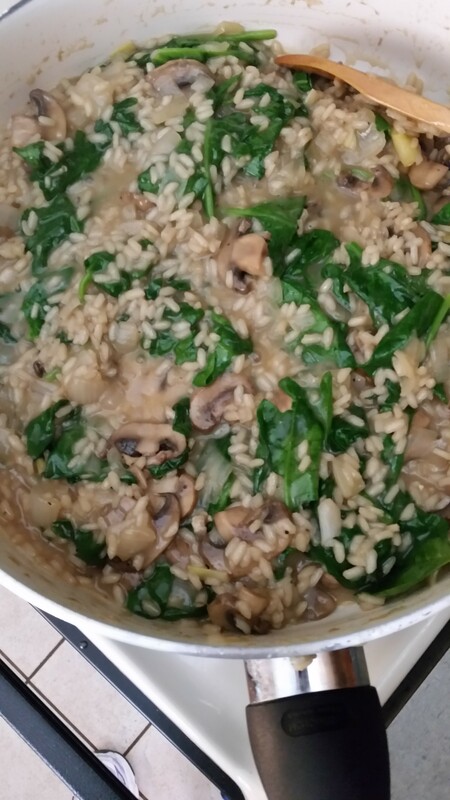 Incorporate the mushrooms into the risotto…it’s almost done! Now let’s wilt the fresh organic baby spinach and pack in the vitamins! Plate and add a little Romano cheese…oh dear! 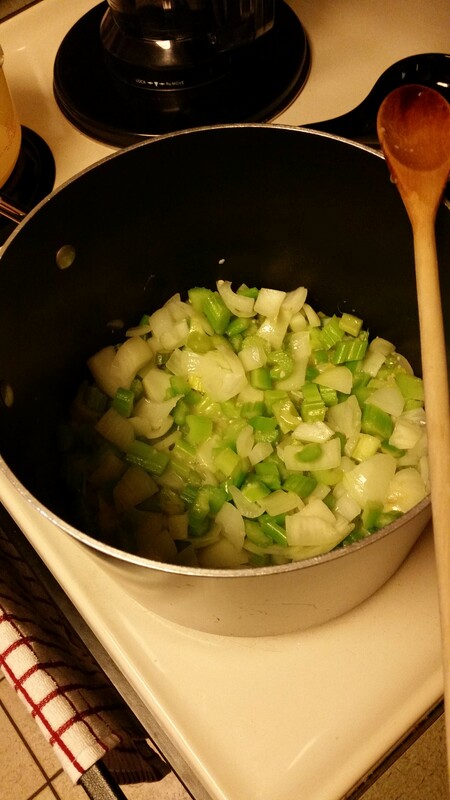 Oh…forgot to add the scallions that I cut! They really add to the flavor profile…bon appetit! 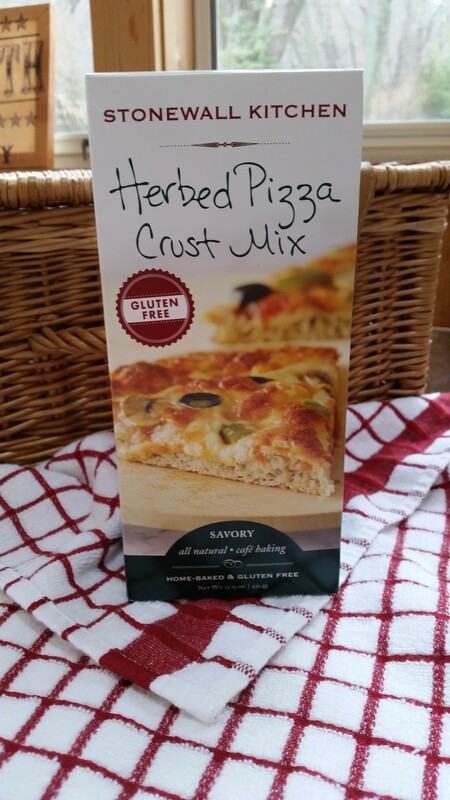 Pizza from a gluten-free mix! Sorry that it’s been so long since I’ve posted, but this winter has not been kind to me! Let’s just say I am so happy to say “Spring has sprung” and I look forward to reconnecting with all of you! I rarely make anything from a gluten-free mix. But I have to ask myself why I don’t! If the ingredients in a mix are well balanced and don’t include much salt and/or sugar, I will consider trying it! Hey, I’ll try anything at least once and if it works, it’s a keeper! Such is the case with Stonewall Kitchen Pizza Crust. I grabbed a box and decided to give it a whirl! The directions were clear enough so I went to work. but to my surprise, it filled the pan! 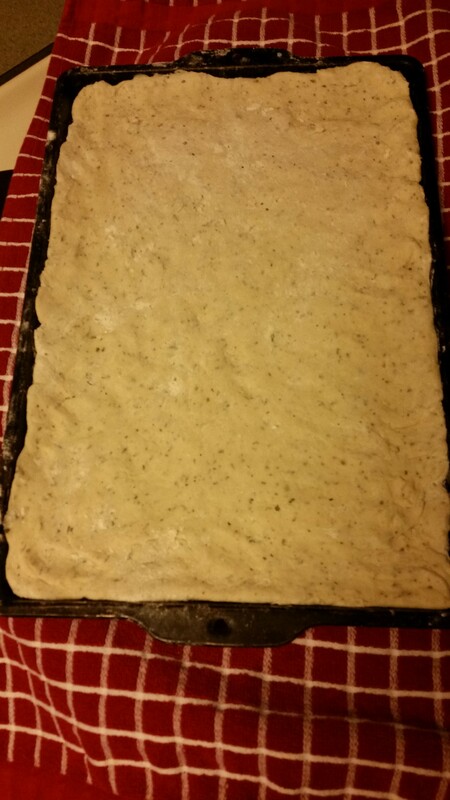 One problem: the dough didn’t rise as expected when I put it in a “warm” place. So I put it in the oven on warm for a short time and voila! Now onto my toppings! Yay! I generally just use a can of crushed organic tomatoes with lots of seasonings. 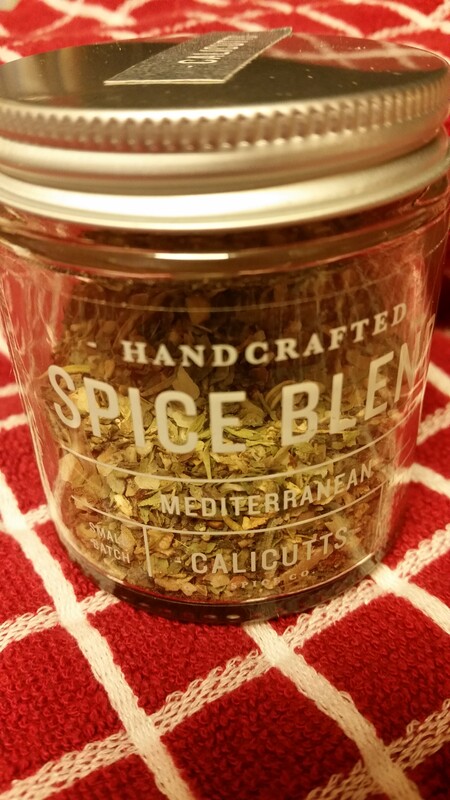 Since Daria started partnering with Calicutts Spice Co., I have become infatuated with Robert’s “Mediterranean” spice blend. 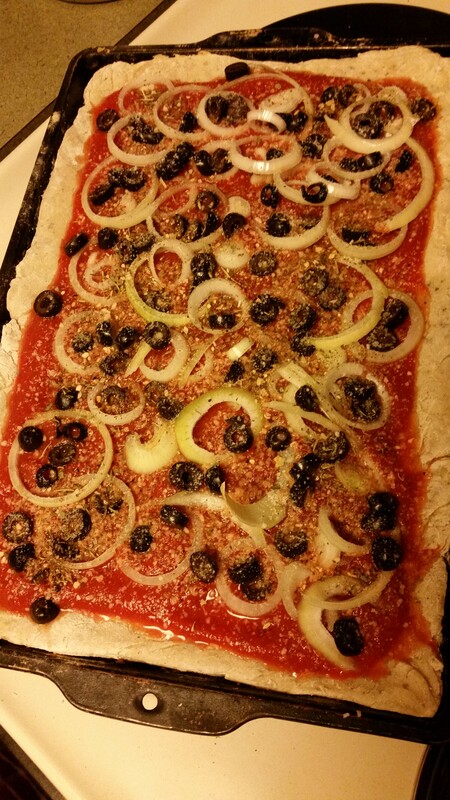 Anyway, a little sprinkle of Romano cheese, lots of “Mediterrean” spice, some fresh onions, and black olives and it’s ready for the oven! 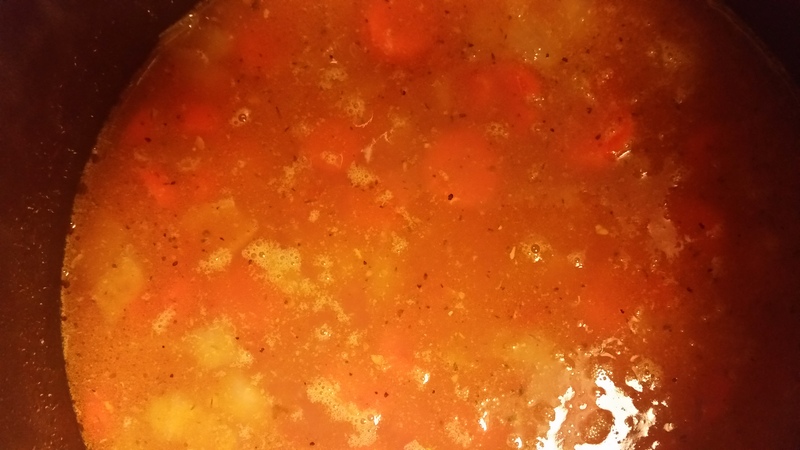 I wish you could smell what my kitchen smells like now….oh dear! 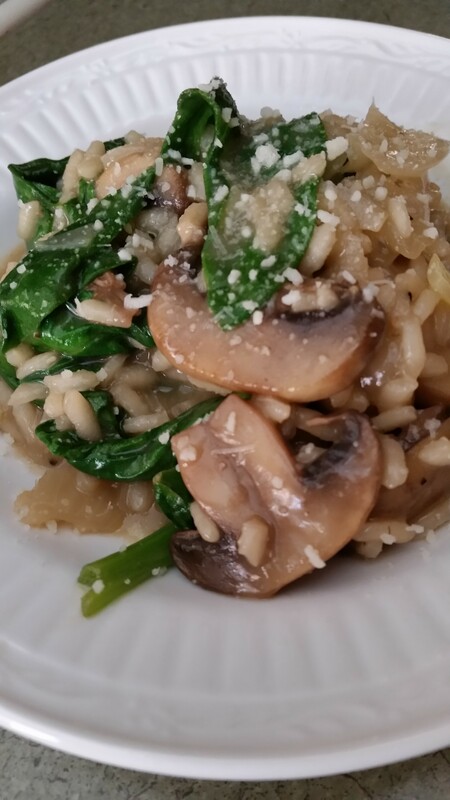 What a perfect Lenten meal when we are going meatless! Just glad I bought this mix….you should, too! 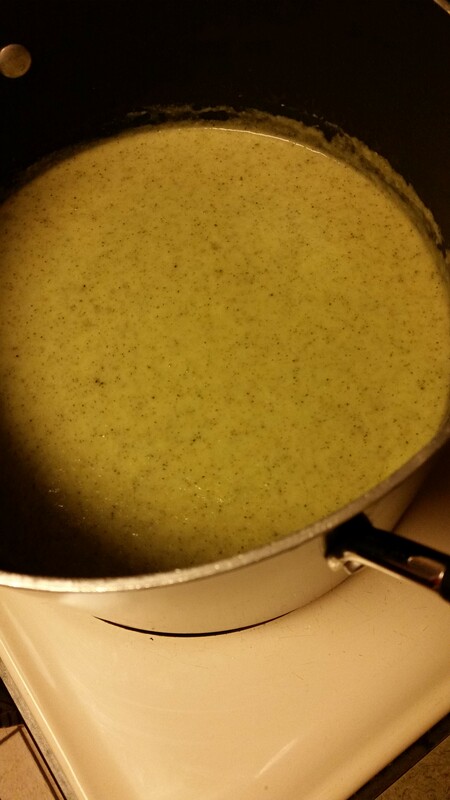 Cream of broccoli soup and Mac ‘n cheese….does it get any better? Can you say it twice? Well, that’s what you will be saying when you make these two great dishes! 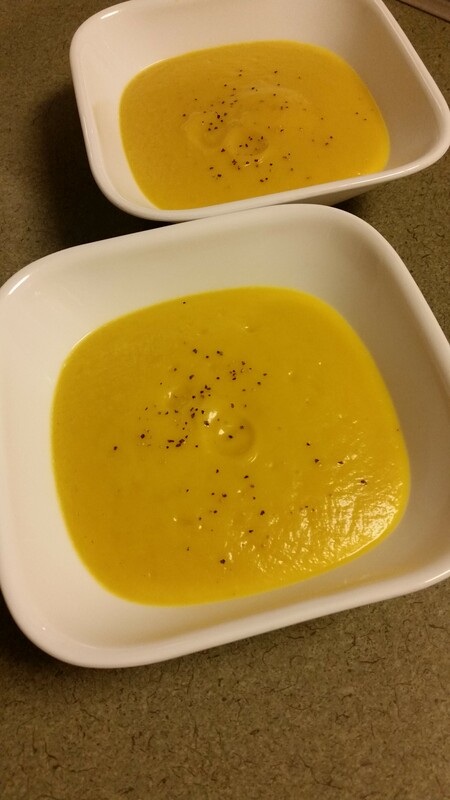 The first and last soup of our celebration this month is a wonderful recipe shared with us by a great friend, Mike. We remember tasting it for the first time several years ago and we were hooked! It’s relatively easy but you’ll need some patience and a good blender. 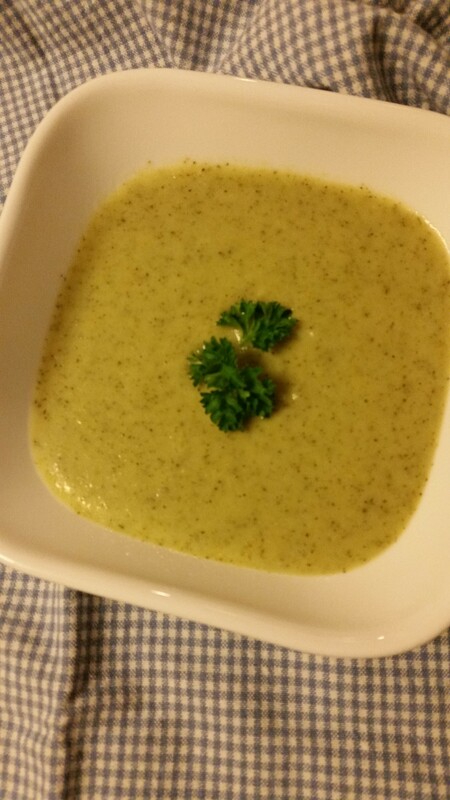 Since it’s a creamed soup, you will need to purée it when all of the ingredients are done cooking. It’s so worth the extra effort….you’ll see! First begin gathering your ingredients and then follow this recipe! 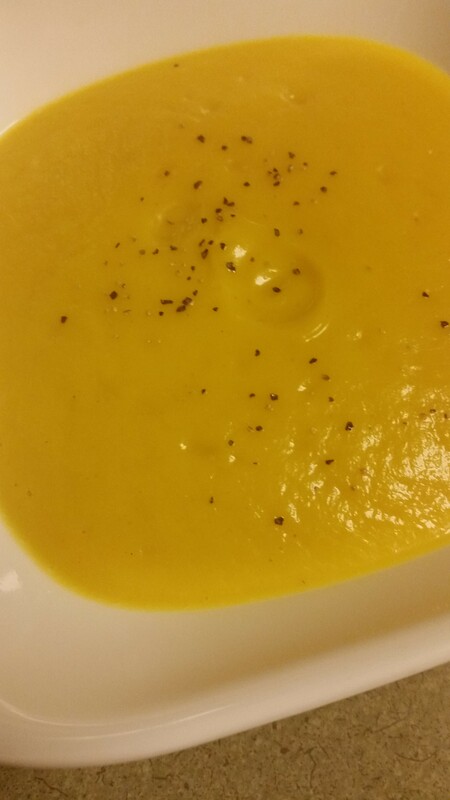 Purée the soup in a blender. We split the batch in two and then added it back into pot! This soup can be served with a dollop of sour cream or grated cheddar cheese or plain. We love to garnish it with fresh parsley! 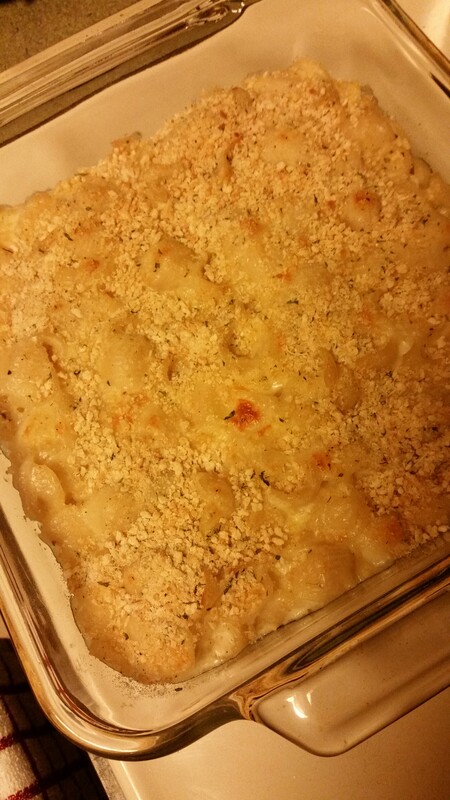 And now…for our homemade gluten-free Mac ‘n Cheese to eat alongside the soup! 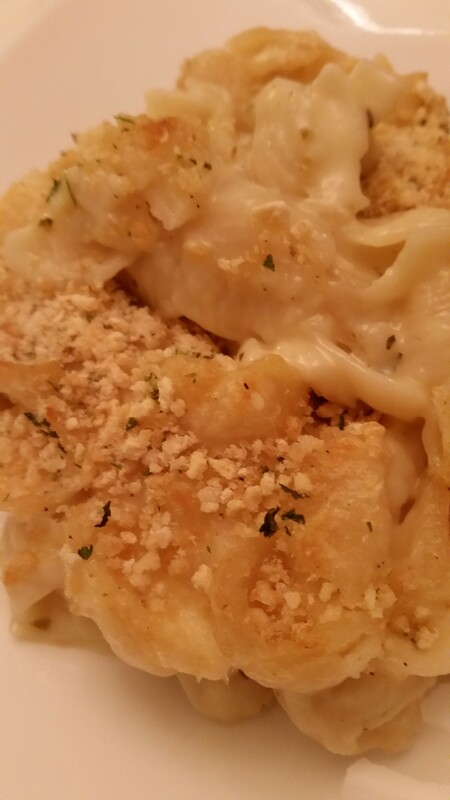 This recipe fills an 8“ x 8” glass baking dish with oooey, gooey goodness! Cook 8 oz of your favorite gf pasta according to package instructions (we love Tinkyada rice pasta and used half of a bag of elbow macaroni). Meanwhile, gather your other ingredients! On medium heat, melt the butter and add in the garlic. Sauté for 30 seconds, add in arrowroot flour and whisk to create a roux. Now whisk in the milk. Reduce heat to low and add in the cheeses and melt (should melt really quickly!). Combine the cheese mixture with the pasta. Add a dash of pepper. You may also add some red pepper, if you like. Place into a small baking dish sprayed with Pam or any cooking spray. 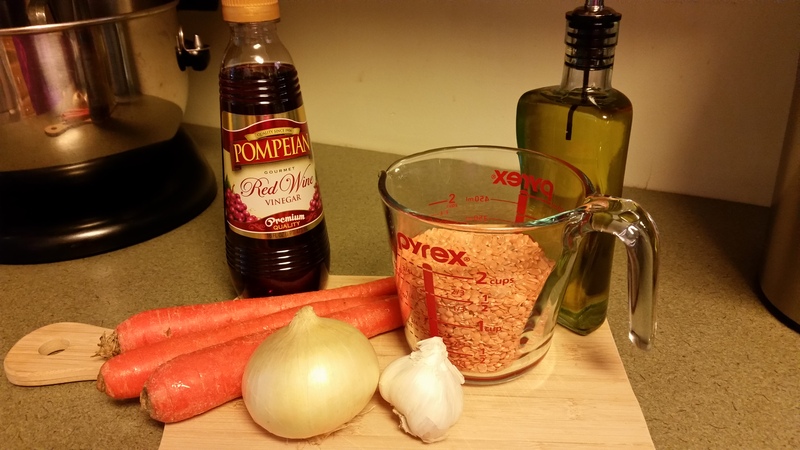 Top with some gluten-free bread crumbs and sprinkle top with Romano cheese. Bake at 400˚ for 20 minutes. If you want the top of your mac ‘n cheese golden, you can place it under the broiler for a few minutes before serving….just watch it doesn’t burn!! This is such a satisfying lunch or dinner! The combo of these two comfort foods is the best! Hope you try these and if you do, let us know how you like them! It’s Christmas week and I have a million and one things to yet accomplish! And I woke up with a head cold! 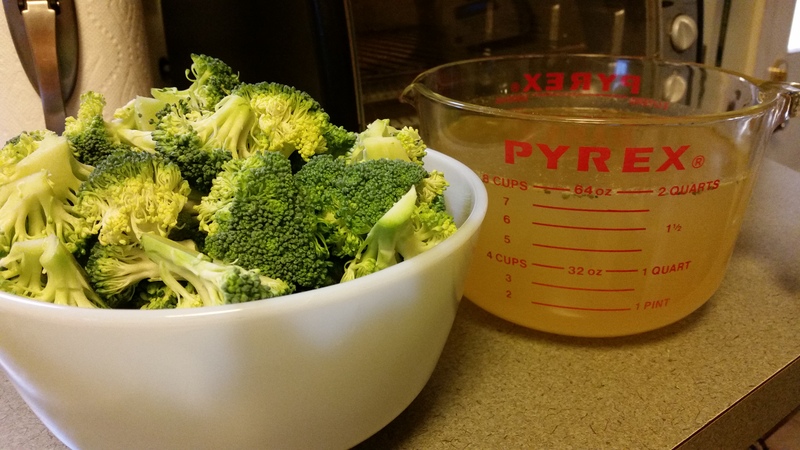 I need some nutritional intervention….maybe some soup! I head off to the grocery store and wander aimlessly around the produce section. 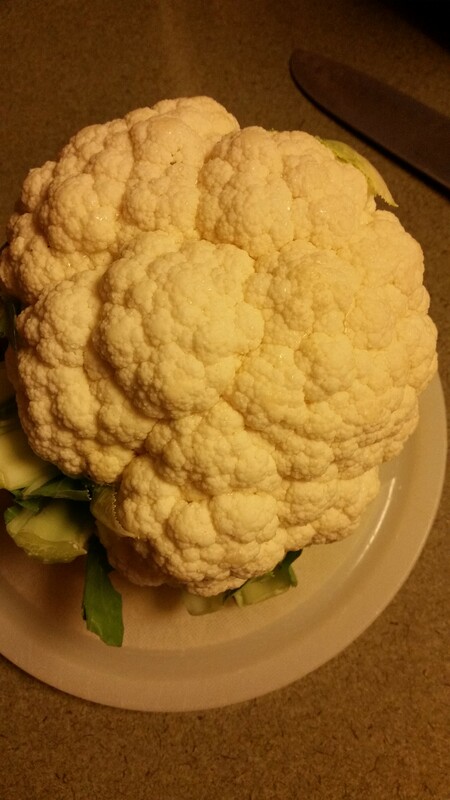 What can I do with a giant head of cauliflower? 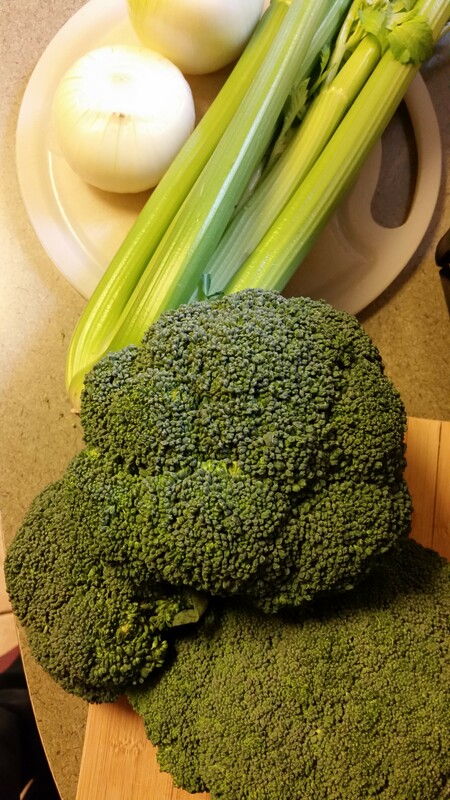 I found this lovely veggie at Weis Market and I just had to find a great recipe to do it justice. So, as soon as I got home, I cruised Pinterest and lo, and behold, there it was! 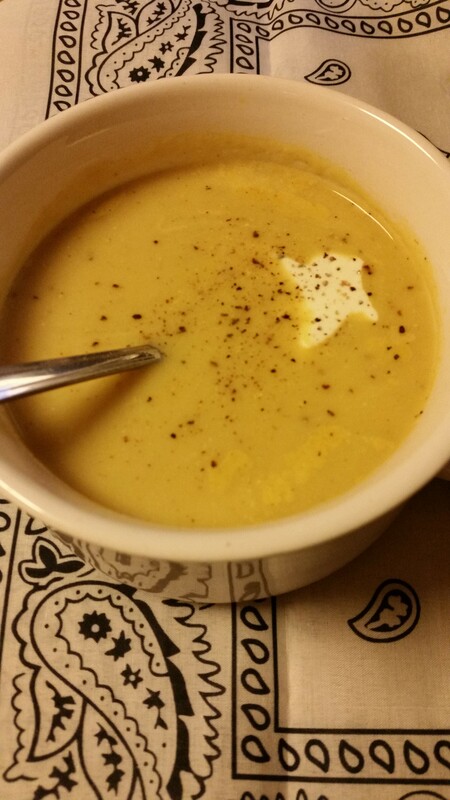 Creamy Spiced Cauliflower Soup on a lovely food site called, Produce on Parade! This was one time that I didn’t need to “reinvent the wheel” so to speak….I didn’t have to change a thing…. the recipe is both gluten-free and vegan! And did I mention that it is so delicious? 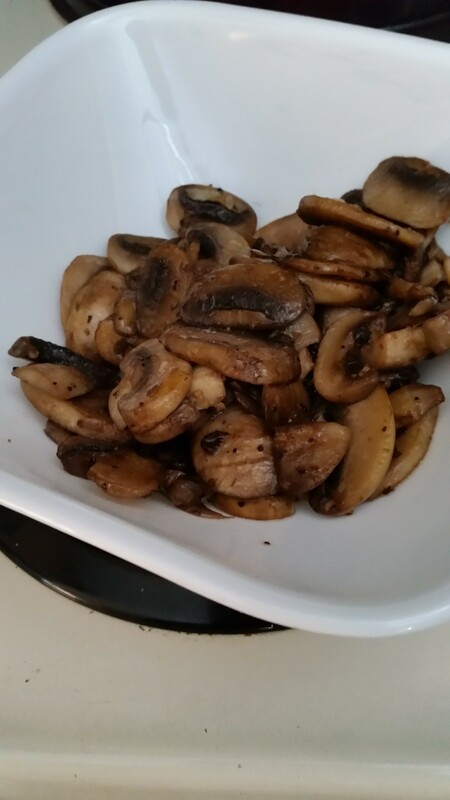 The recipe is very straightforward and can be made in a relatively short amount of time! 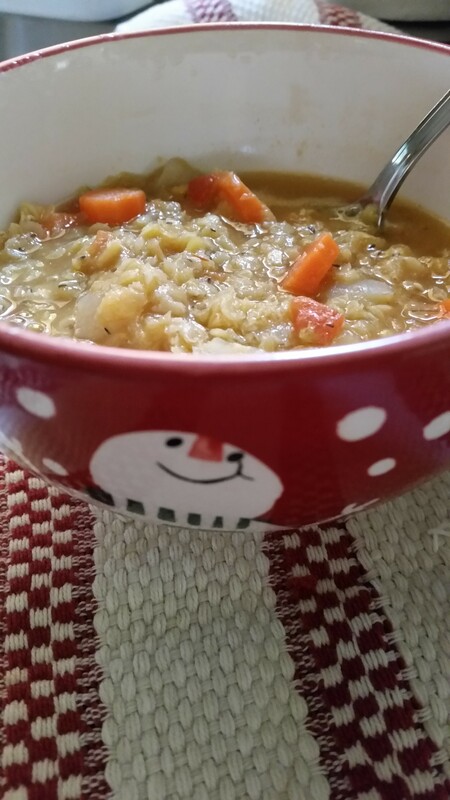 Here are some of my soup pictures. I can’t even tell you how wonderful my house smelled when the aromatics were sautéing! Cumin, coriander, turmeric and cardamom, oh my! 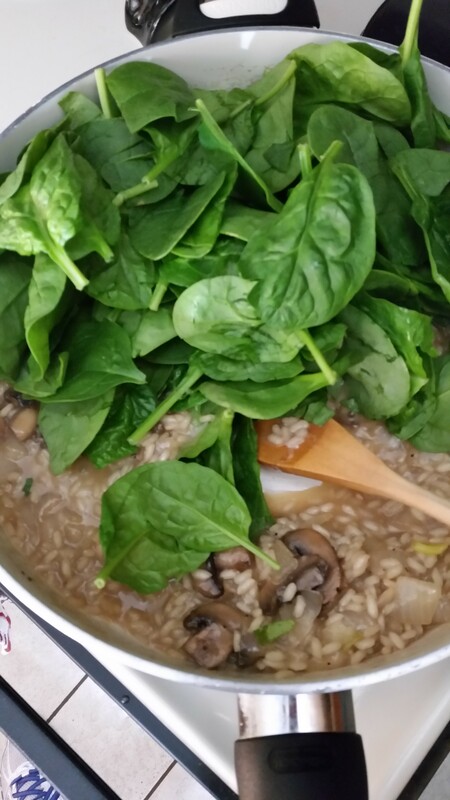 Look at these healthy ingredients getting all happy in the pot! so I added a wee bit of dried dill to the soup right before eating! It was Lewie’s idea to add a dollop of sour cream and that was an added flavor, too! 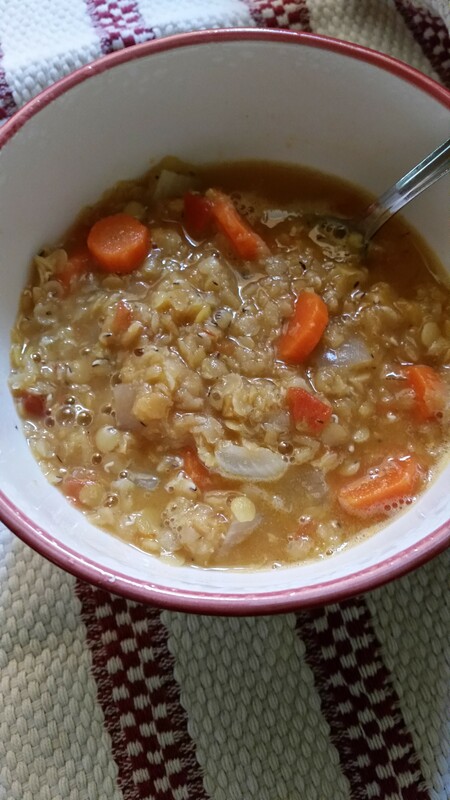 You really need to try this soup! Thanks, Katie…you have a few new followers! 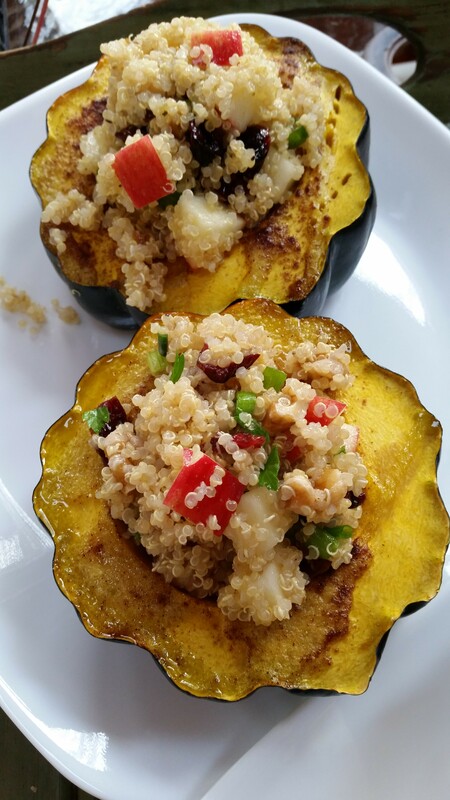 Acorn squash with a gluten-free twist! 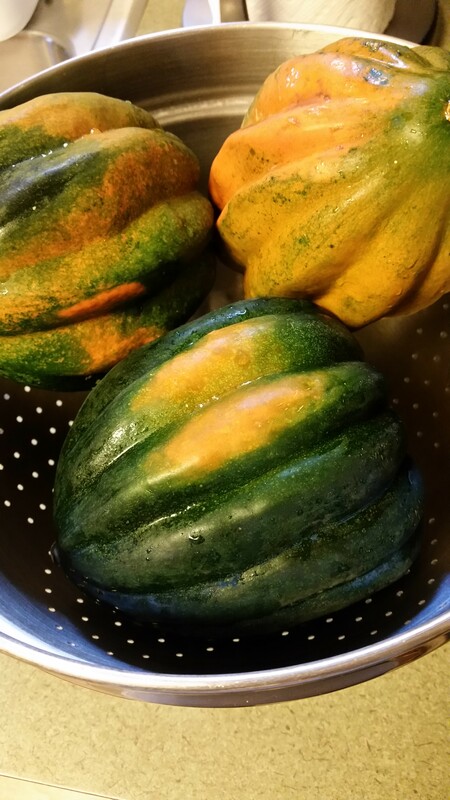 If any of you are regulars on Facebook, you may have seen a post for a delicious way to make acorn squash. The stuffing looked amazing and had sausage and lots of gooey cheese in it. gluten-free (of course) stuffing for our acorn squash. 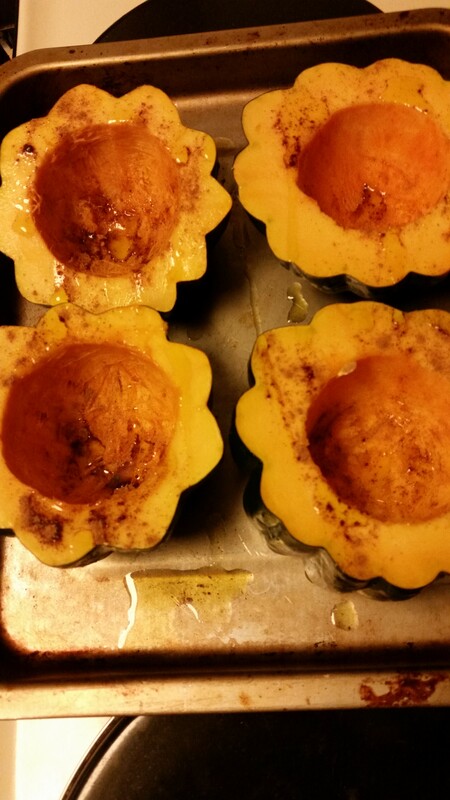 After washing and removing the seeds from our squashes, we roasted them with a little olive oil and pumpkin pie spices. What an aroma! The whole kitchen was happy! While the squash was roasting, we chose our ingredients for the stuffing. 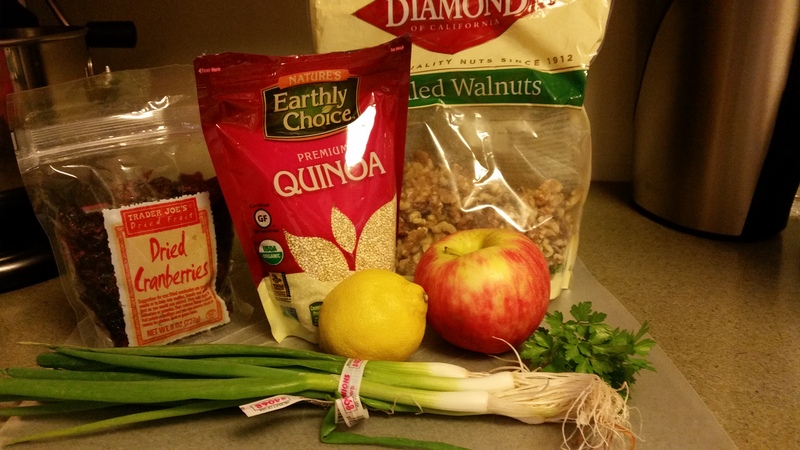 What would be a better base for a stuffing than some yummy quinoa? Yes, quinoa it would be! And what delectable food ingredients can we add to the base? and lemon zest to pump it up! Here is the step-by-step recipe for you! Cut 2 acorn squashes in half; remove seeds. 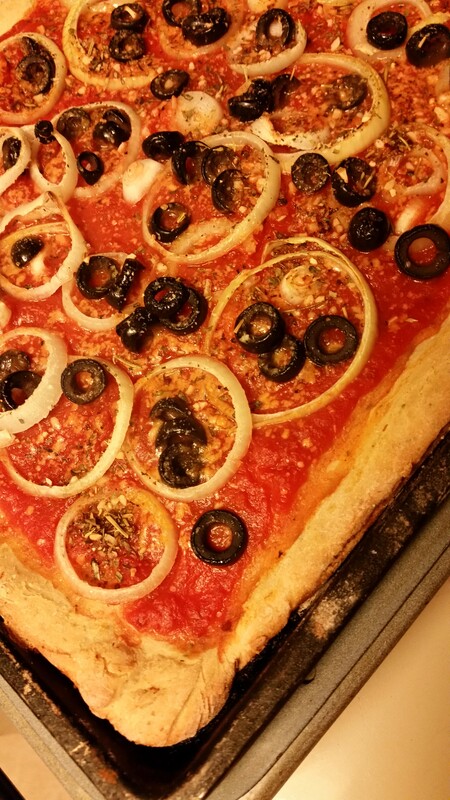 Drizzle each piece with olive oil. Bake in a 400 degree oven for 40 minutes. 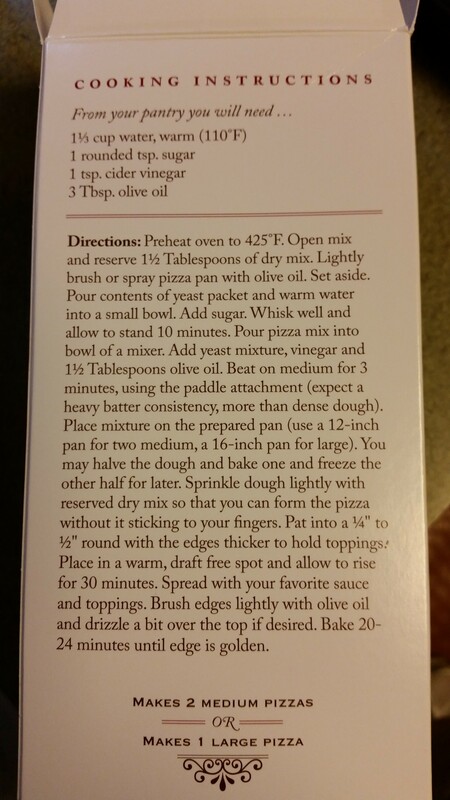 Meanwhile, cook quinoa according to package directions. Place one cup dry quinoa into 2 cups of water, bring to a boil and then simmer for 20 minutes. 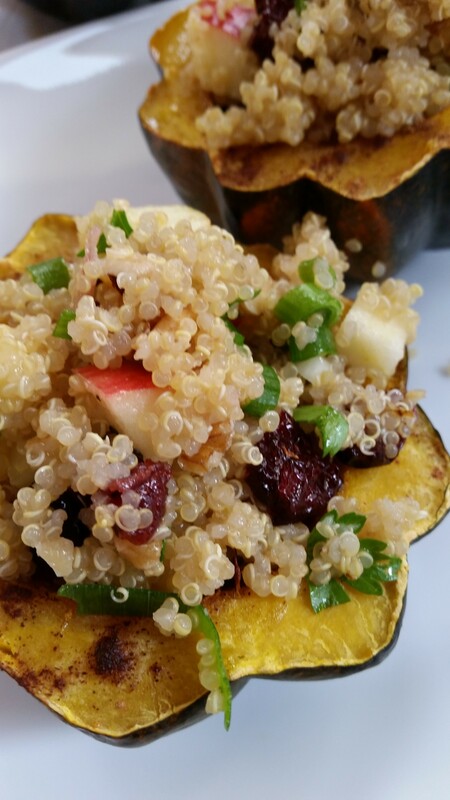 While quinoa is cooking, chop the Honeycrisp apple into bite-size pieces. Dice scallions and chop fresh parsley. Chop a handful of walnuts. Set aside in a bowl. 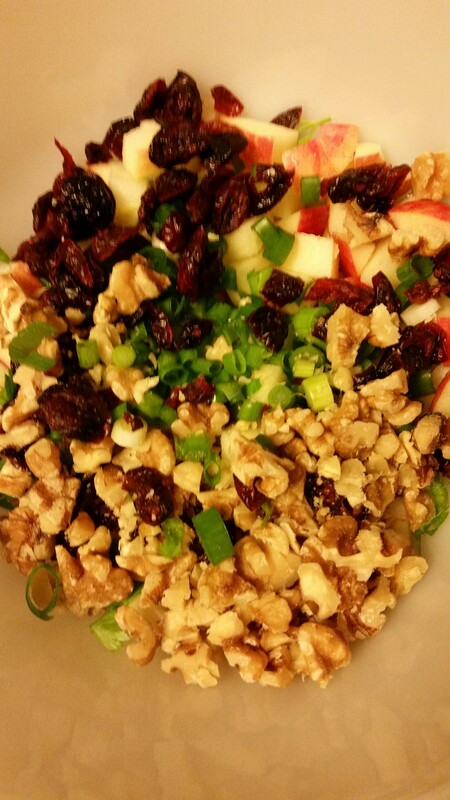 Now add a handful of dried cranberries to the bowl. When quinoa is done, remove from the pot and spread on a cookie sheet to cool slightly. 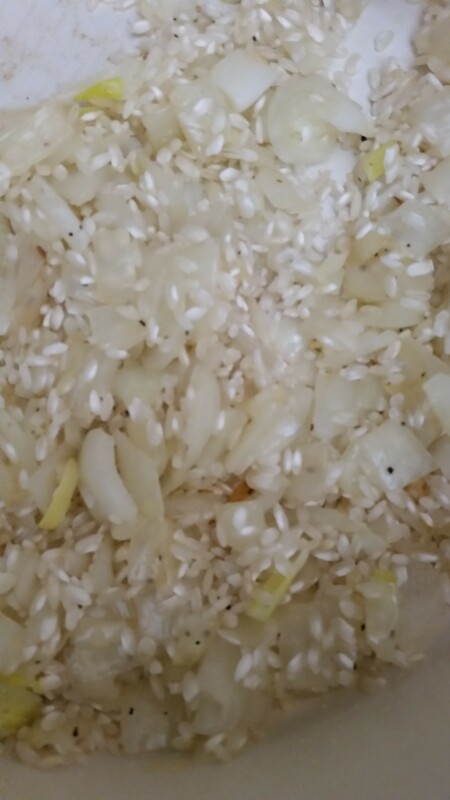 Make the dressing with the juice of one whole lemon, add some zest from the lemon and combine with sunflower oil. Add salt and pepper to taste. 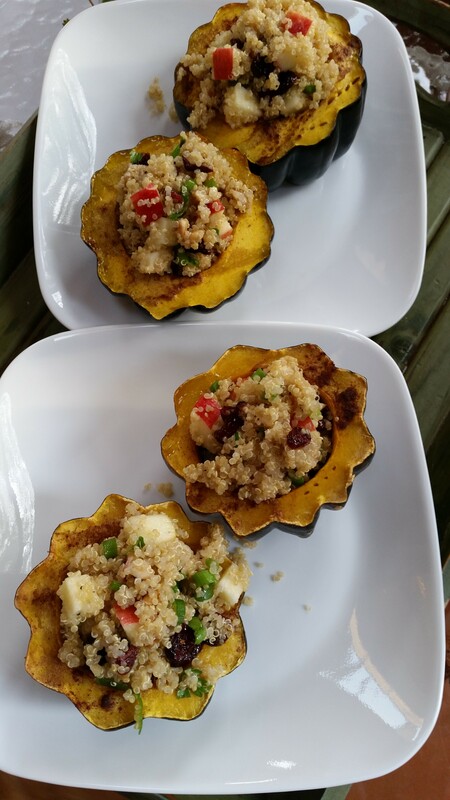 Now assemble the dish by placing squash onto each plate and fill the cavity of each squash half with the quinoa stuffing. 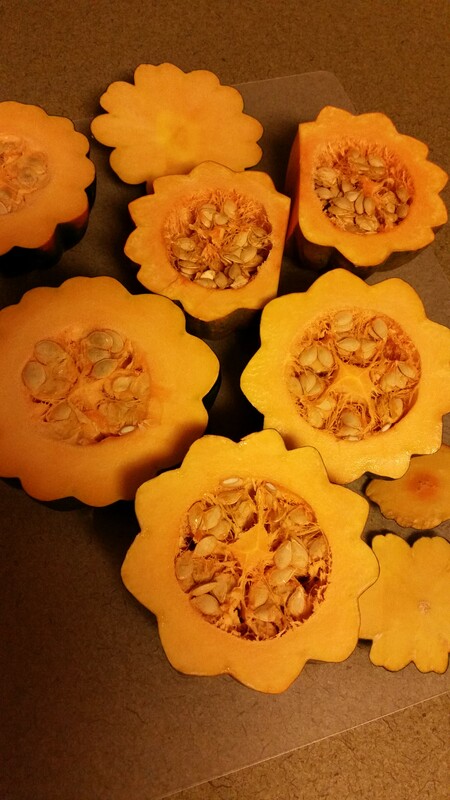 Note: We started out with three acorn squashes and when we cut into them, we ended up with only two! Make sure you look at them carefully when purchasing them! You will have more stuffing than you need but guess what? It’s a great lunch for tomorrow, without the squash! This dinner was not very labor intensive and it was delightful! Enjoy as much squash as you can while it’s at its best!